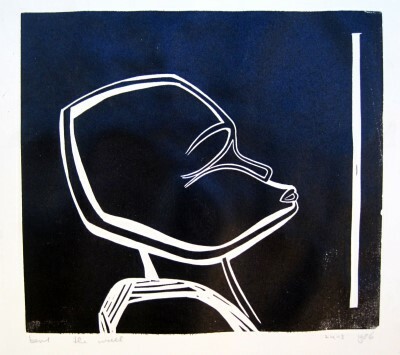 In 1970, living in the city of Leeuwarden, capital of the province of Frisia (Friesland) of the Netherlands I almost incidentally got into printmaking. I met an artists, Frits Drent, who made beautiful dry points. His work was totally a-fashionable, figurative, atmospheric and stimulated me to try the technique. By luck I found an old fashioned leather press that with some improvisation could be used to print dry points, etchings and lino cuts. I was ready to go into the graphic arts. Frisian landscape. 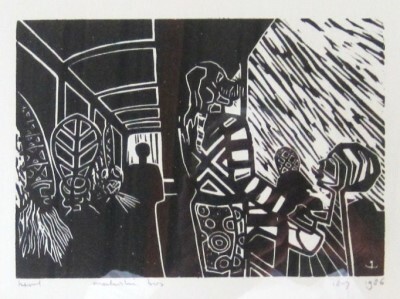 Dry point, 17.5 x 16 cm, 1973, edition 2/15. Printed on a leather press using mostly studio made ink. The subject is inspired on the Frisian country side: flat, water, skies, windy. Threatened Land. 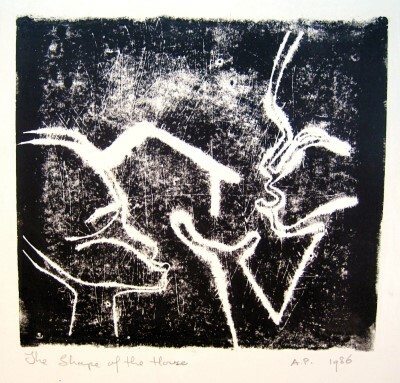 Dry point 19.5 x 16 cm, 1973, 2nd print of 2nd state. The subject is the looming destruction of our natural environment. The landscape itself is inspired by the dune landscape at the Dutch seaside. In 1975 I departed from the Netherlands to start a new life now as full time artist in Zambia. In Zambia there was no shop where you could by all these beautiful materials you use in the fine arts. But there was linoleum. That is how I got into lino cuts. 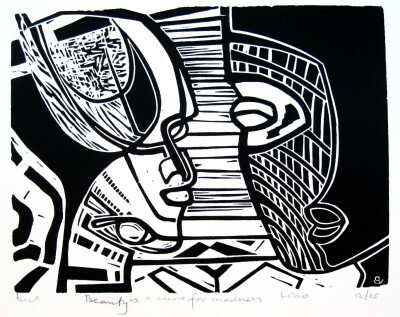 The designs below are all lino cuts. They are numbered chronologically. Print date is not necessarily design date. Design date is carved in the print, print date is the date in writing under the print. All prints are printed on quality paper. You can use the e-mail button at the right top of this page if you are interested to buy or want more information. We can e-mail you an illustrated catalogue (in spreadsheet) - it is about 1 Mb. Prices are ex-works and range from ZMW 500 to 1,500 or USD 50 to 150. Female. 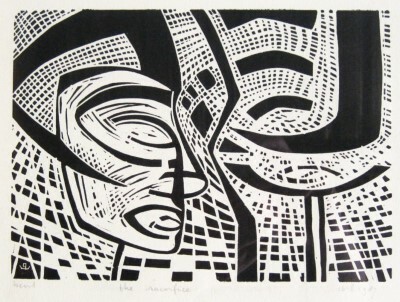 Linocut, 1986, 15 x 12.5 cm. ZMKr 350. USD 65. Print 12. The Proposal. 1986, 30 x 31.5 cm. Print 13. Beauty is a Cure for Madness. 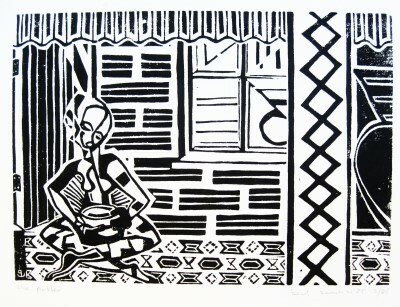 2001, 20 x 15 cm. Print 14. The Potter.1986, 21 x 15 cm. Print 16. Sacrifice. 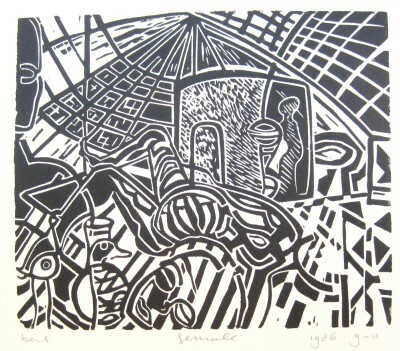 1987, 21 x 15 cm. Print 17. Seeing Makishi. 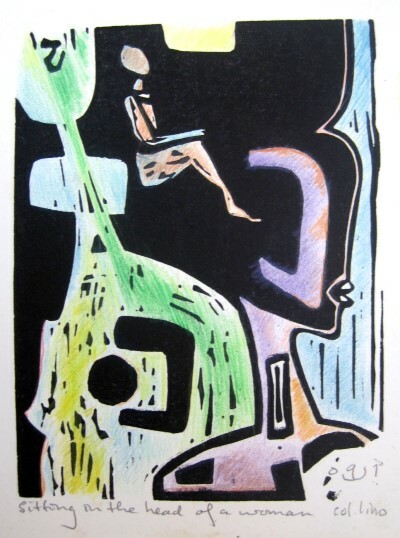 1987, 15 x 21.5 cm. Print 18. Makishi Bus. 1986. 21 x 15 cm. Print 20. Plus Minus. 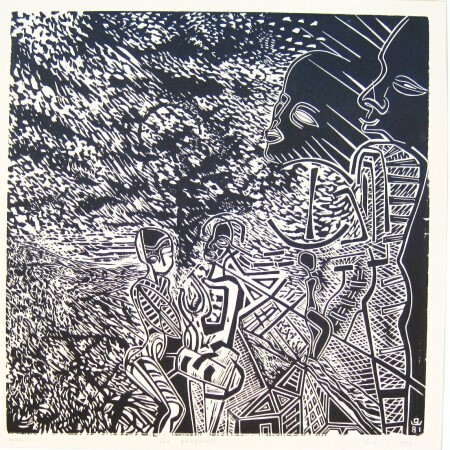 1986, 16 x 14.5 cm. Print 21. Dancing Pose. 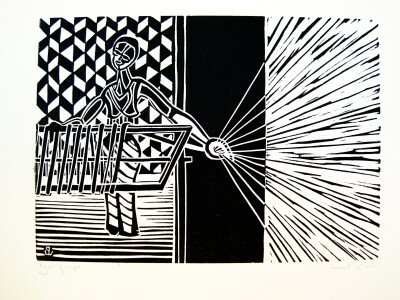 1986, 14 x 29 cm. Print 24. The Wall. 1986, 18.5 x 15.5 cm. Print 25. Shape of the House. A.P. 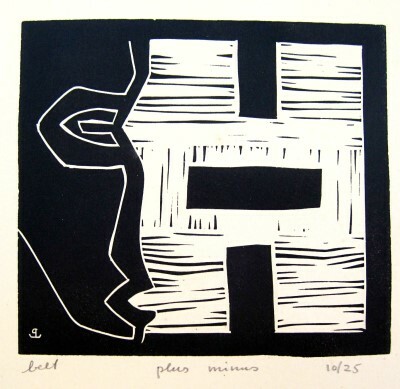 1986, 25 x 23 cm. Print 27. 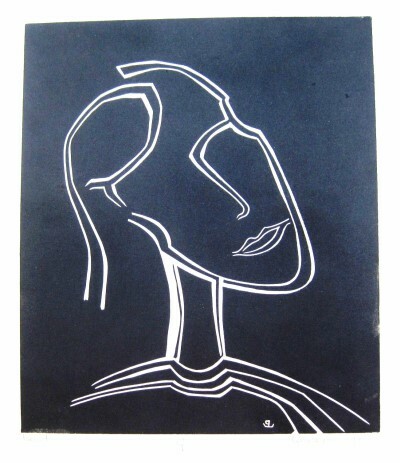 G. 1987, 17 x 20 cm. Print 28. Facially. 1987, 9.5 x 26 cm. Print 30. Sitting in the Head of a Women. 2001, 10.5 x 15 cm.